Recently Facebook issued an update to their Android app which added some permissions including the ability to record audio without the users permission and the ability to wake the device from sleep. Never have I seen such a seemingly nefarious combination of permissions. Is it the NSA monitoring us or just Zuckerberg? Later word got out that Facebook was "just" monitoring audio to determine what kinds of music and shows their users enjoy so they can better cater advertising. I'll set aside my moral obligations to companies spying on me for a second and just focus on the fact that they are stealing my battery life and I'd like them to stop. The best option is probably to just stop using the offending apps, but if you still want to use facebook (or instagram) you're in luck because there is an alternative. A hidden feature called App Ops allows you to have granular control of app permissions. In Android 4.3 a new feature was added called App Ops, but it was hidden because it was only intended for internal use by Google's developers (or at least thats the rumor). You can access App Ops simply by going to the Google Play store and searching for "App Ops" and downloading an App Ops launcher. Once installed you can simply click the App Ops icon and it will load the App Ops screen allowing you to have full control over the permissions for each app. 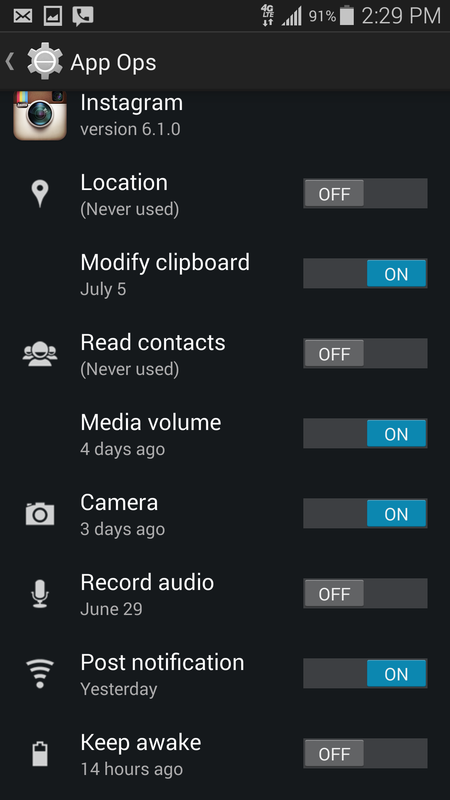 However, in Android 4.4 (and 4.5) App Ops has been removed entirely. If you try to load any of the App Ops launchers you will see that they either do nothing of completely crash. However, if you root your phone you can use App Ops by "Lars Team" to install it. Their app detects that you don't have App Ops and some how (no clue how) re-installs or re-enables it. 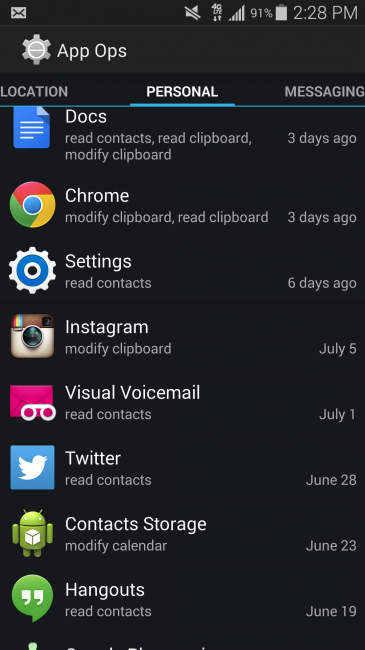 Then you can deny any permissions to any apps you need. For me I never record video or audio using Facebook or Instagram so I just totally blocked them from recording audio, but the main thing is blocking them from being able to wake the device from sleep / preventing the device from sleep. This ensures that they aren't doing things without your permission. 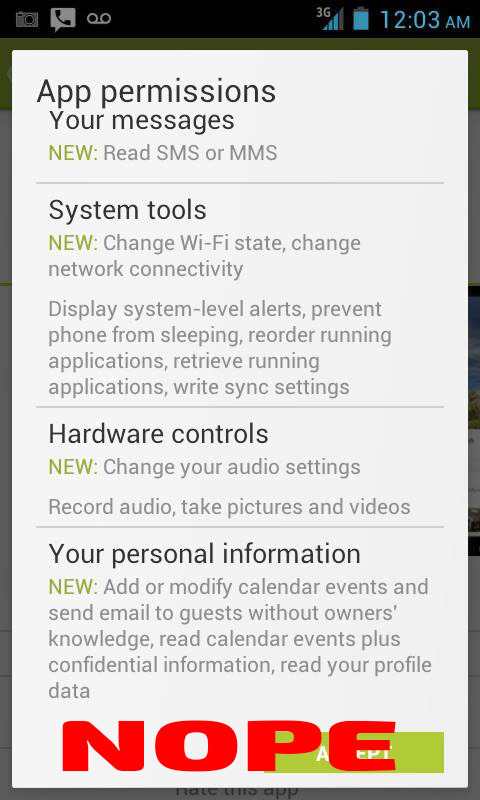 If you're really paranoid you could just turn all of the permissions off and turn them on manually as needed. Here are a couple pictures of App Ops in action and showing how you can manually control the individual permissions of any app on your phone.